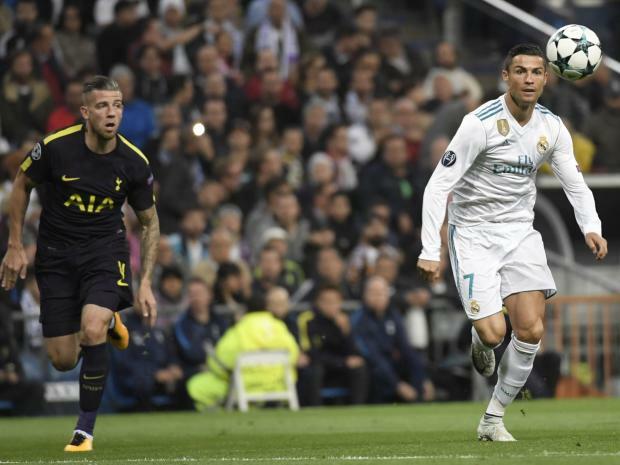 La Liga champion Real Madrid has played their last match against Tottenham Hotspur which was the competition of UEFA Champions League. At the beginning of the match, Hotspur scored a goal and so, Real went behind of them. They missed plenty of chances but finally Cristiano Ronaldo saved the team by scoring one goal. Based on his score, Real made a draw with Tottenham in their last UCL match. The match was hosted at the home venue of Real where Real were about to lose the game. Finally, with the Cristiano’s goal, the team of Zidane left the ground with a draw. At Estadio Santiago Bernabeu on Tuesday night, the match of H group in UCL was drawn by 1 – 1. In Champions League competition, at the home venue, Real remained unbeaten consecutive seventeen matches. However, the ball was under the control of Real most of the times and they also made several attacks to the opponent goal post. The two times consecutive UCL champion team’s players Isco, Karim Benzema or Ronaldo could not bring the match winning goal. If their luck was with them, at the beginning, the result of the match could change. Hakimi made a cross pass from the right side and Ronaldo made a successful head but the ball hit to the bar instead of found the net. In return ball, Benzema could take the chance but his shot was missed. Karim Benzema played his first Champions League match in this season against Tottenham yesterday as well. In just 17th minutes, the shot of Ronaldo was gone just outside of the post and the guest found another chance. After the two minutes, Tottenham made a counter attack but the head of Harry Jane was stopped by the Navas in exchange for corner. In 28th minutes of the match, finally Tottenham scored a goal and Real got behind of them. From the right side, Kane could not touch the ball which passed from Aurier but unfortunately Real’s player Varane touched the ball to the net. So, Hotspur went ahead by 1 – 0. Just three minutes later, Tottenham stopper Lloris saved the game from the shot of Isco. Just a minutes later, Ronaldo was seen a yellow card for his foul attempt. Just before the first half, CR7 made a spot kick and brought balance to the game. In this season, Ronaldo scored total five goals. In first two UCL matches, he scored two goals in each match. In the second half, both team missed number of opportunities and so, the match finished with drawn. Now after the end of three matches, Real and Tottenham both achieved 7 points each so far.